Arab terrorist charges at group of soldiers in car at Samaria checkpoint; stabbing attempt thwarted in downtown Jerusalem. 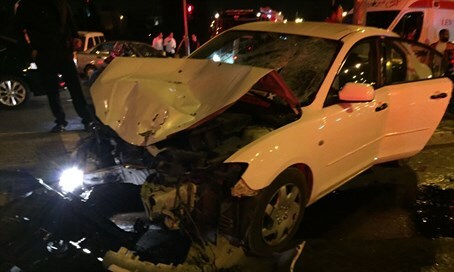 An Arab terrorist conducted a car ramming attack on Saturday afternoon, targeting a group of soldiers at a checkpoint outside the Arab village of Huwara in Samaria. One of the soldiers, aged 20, was lightly wounded in the attack. His comrades opened fired and seriously wounded the terrorist, who later died of his wounds. Security forces and medical teams were dispatched to the scene of the attack. After initial medical treatment, the wounded soldier was evacuated to Beilinson Hospital in Petah Tikva amid fears that one of his legs might have been broken in the impact. The soldier was later released from the hospital, after it was confirmed that he hadn't broken his leg. The car attack was the second high-level security incident of the day. At IDF Square in central Jerusalem, not far from the Municipality building, an Arab terrorist was thwarted in his attempt to stab an officer. The would-be stabber was shot and killed. An initial investigation detailed how the officers had their suspicions aroused by the man, and approached him to investigate. At that point the terrorist whipped out a knife and tried to stab one of them, but the officers beat him to the draw and shot him, killing him at the site.